"Since the discovery of the Higgs boson, particle physics is in a dead end." This is how Spektrum.de starts an article on the results at the CERN, which contradict the current models and suggest a "fifth force". I would go further and say: "Particle physics is a dead end since the discovery of particle physics." The core issue is the double-slit experiment from 1802, which shows that the observed phenomenon simultaneously has wave and particle properties. What is mutually exclusive, since particles can not fly through the air in waves, so we speak of wave-particle paradox or (euphemistically) wave-particle duality. From John Dalton to Niels Bohr, there were then different particle-based Atoms, with which we can describe certain aspects of reality quite well. Since the 1920s, quantum physics has claimed that the "natural laws" are no longer valid in the order of magnitude observed by them (Newton does not apply). This is, from the point of view of science theory, a very questionable advance, which would at least require particularly strong proofs and theories. Modern physicists now speak of "quantum objects", which possess both wave and particle properties, but above all they always behave completely in harmony with each new model within the framework of quantum theory, and must not otherwise be guided by other laws of nature. In the order of magnitude of atoms and of quantum physics, we find ourselves in a boundary where the transition from energy to matter and back again is floating. There, energy is condensed to matter and matter again flow into energy. This can already be observed in the case of radioactive decay, where partial particles fly away (alpha particles) or energy is emitted as hard radiation (gamma radiation). Energy is radiated and radiation is a wave. Particles fly off, there is no such thing as "particle radiation". Matter is to be defined as "all that possesses a resting mass". Physics has only failed to give a name to the particular transition state between energy and matter for a hundred years, and to investigate this more precisely. 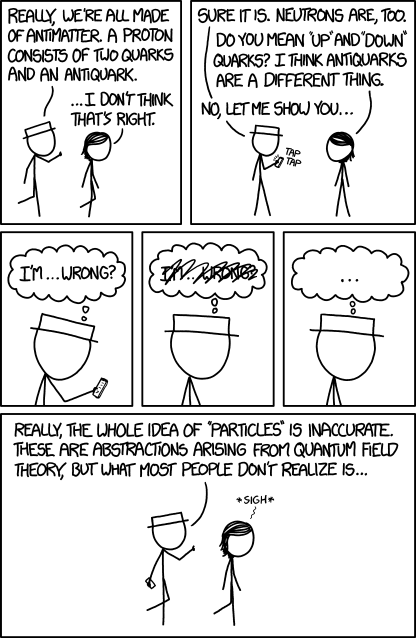 Instead, one has only fixed the particle properties and that is just only half the truth. And, of course, Newton's laws are valid with all the real particles, which then remain. Whoever claims the opposite is to prove it. Not me but the past 5 generations of physicists.